Here’s the latest entry in my Edmonton Etcetera series, in which I share some thoughts on a few topical items in one post. Less than I’d write in a full post on each, but more than I’d include in Edmonton Notes. Have feedback? Let me know! There has been a bit of discussion recently about the transition pay that Amarjeet Sohi collected when he left office. As outlined in Council’s Compensation, he collected a little over $46,000 for his 8 years of service (the transition allowance is “three weeks salary for each year served, to a maximum of 36 weeks”). “Severance allowances serve the purpose of assisting individuals to bridge the period between the time that they leave a position until they re-enter the workforce in another position. Most severance allowances are linked directly to length of service and include a maximum pay out. In addition, most employees have access to Employment Insurance benefits to help bridge the gap during a transition to another job. Council voted on this issue back in June 2006, and actually made it retroactive to 2001. It passed 12-1, with the only dissenting vote coming from Councillor Mike Nickel (he voted against the entire motion to adopt the report’s recommendations). While I can see the point Councillor Oshry is making, I don’t agree. 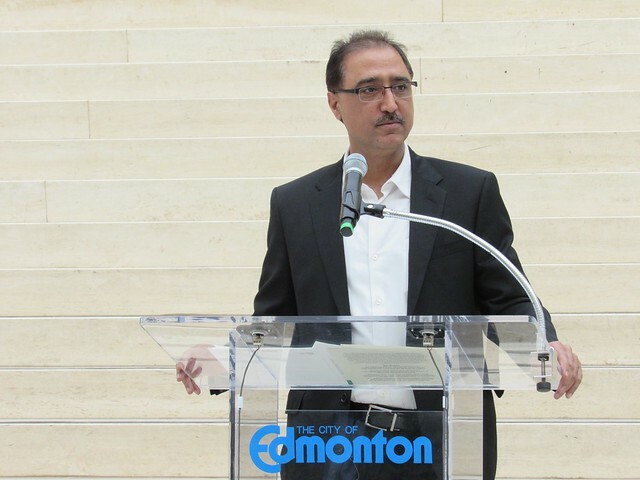 Amarjeet Sohi served for eight years (in my view quite effectively) and I think he’s entitled to all of the compensation that goes along with that. Any legislative change would have to fall within the rights of the Charter, and would also apply to “all variations of amplified noise”, including sporting events and outdoor concerts, so that could make a solution tricky. One idea is to restrict amplified noise in certain locations, such as within a certain proximity to building entrances. Another is to require preachers to obtain a permit, just as buskers must do. Ultimately, Council decided to request a report outlining “what other municipalities have in place to regulate amplified noise in public spaces” and information on legislative options that could be used to address the issue. That report is slated to come back to Council in April. “I think the noise complaint is really a content complaint, wrapped in a noise complaint,” said Nehemia Smeding, who preaches on street corners twice per week. Smeding said he and his fellow street preachers use amplifiers so their message can be heard over the roar of traffic and crowds downtown. I generally don’t have an issue with noise downtown, especially during the day. There are often organized protests that wind their way through the core making use of a megaphone along the way. I’m even happy with the odd outdoor concert that takes place on the streets during the summer months. However, because of all the buildings downtown noise is already amplified, even without a speaker. So while I can understand what Smeding is saying about wanting to be heard over the traffic (crowds? really?) I think there’s a reasonable limit. It’s probably too loud when I can hear clear as day on my 12th floor condo on 104 Street the preaching coming from 103 Street and 102 Avenue, which seems to have happened much more frequently in recent months. Blame the nice weather, I guess? As you might expect, this isn’t the first time the issue has come up. Back in 2000, street preacher Tony Hritzuk was charged for apparent disruptions along Whyte Avenue. But not noise disruptions – he was charged obstructing pedestrians. The Traffic Bylaw (PDF) states that “a person shall not stand or be in any other position on a highway so as to obstruct the entrance to a building or to obstruct pedestrians or vehicles using the highway.” He and his lawyer said they’d fight the charge under the Charter, and the charges were dropped. Please take a moment to share your thoughts with us! And if you’re not already a member, consider signing up for the Edmonton Insight Community to give input to the City on a wide range of topics each month.